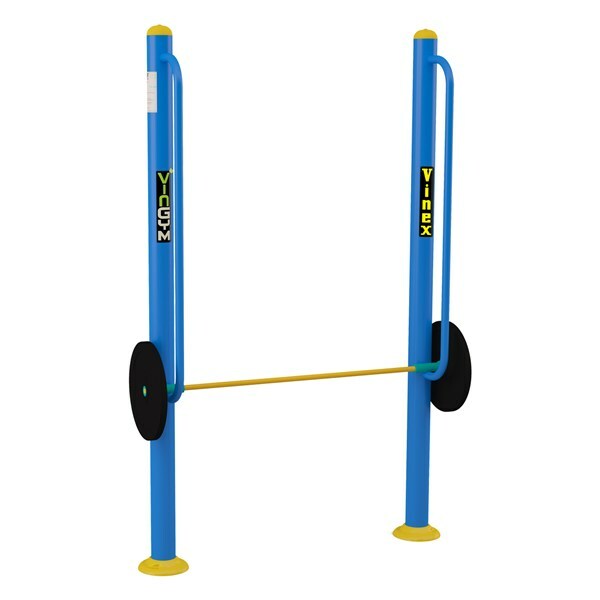 This outdoor fitness equipment is made of heavy gauge steel with strong construction to last in outdoor environments. 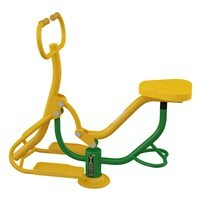 The equipment is powder coated in vibrant colours for a durable finish. It can be easily installed with minimal maintenance requirement. Emphasizes on the Front and Back Upper Leg Muscle exercises. It also assists in leg stretching and waist stretching. 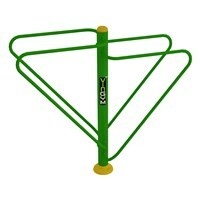 This outdoor fitness equipment is made of heavy gauge steel with strong construction to last in outdoor environments. 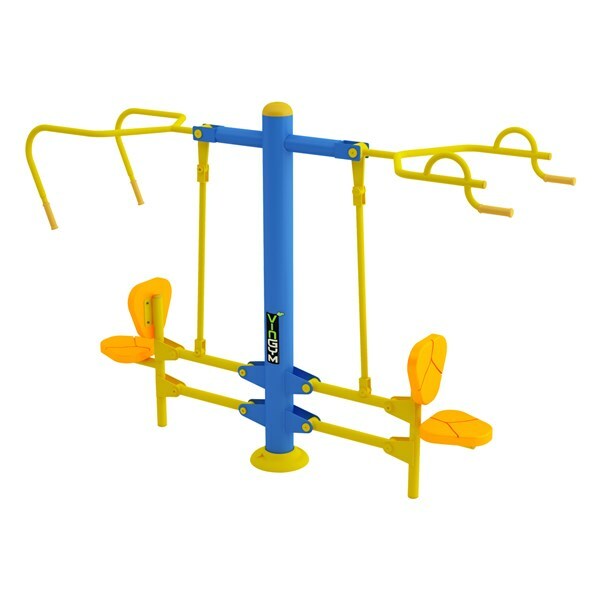 The equipment is powder coated in vibrant colours for a durable finish. It can be easily installed with minimal maintenance requirement. This equipment emphasizes on the stretching exercises. Improves physical performance, body balance, aerobic capacity and flexibility. VEXGYM-ARWK ...... ...... Size : 1330 mm x 600 mm x 1400 mm . 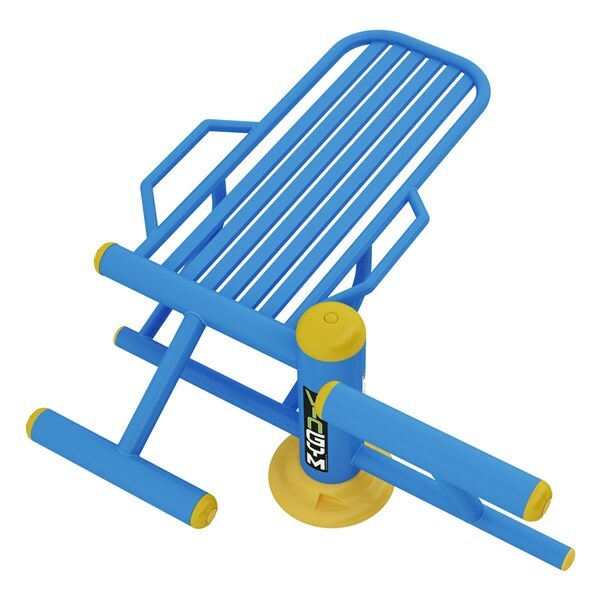 This outdoor fitness equipment is made of heavy gauge steel with strong construction to last in outdoor environments. 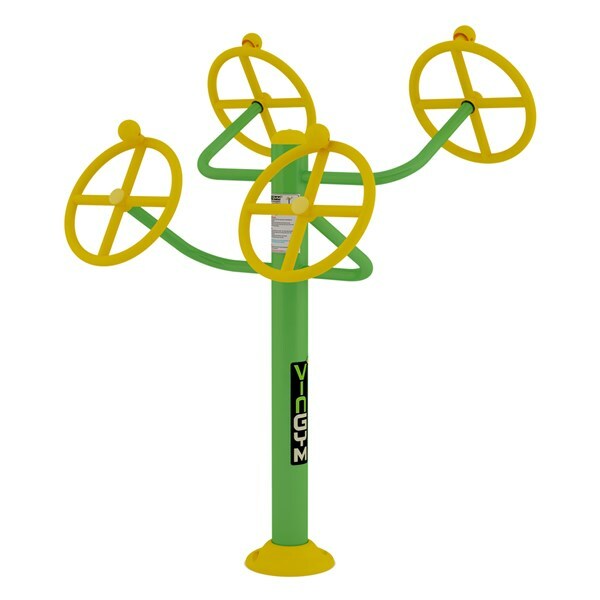 The equipment is powder coated in vibrant colours for a durable finish. It can be easily installed with minimal maintenance requirement. 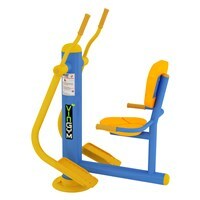 This equipment emphasizes on the Legs and Arms muscle exercises. Assists in strengthening the joints and cardiovascular system. 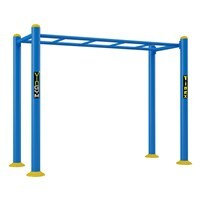 This outdoor fitness equipment is made of heavy gauge steel with strong construction to last in outdoor environments. 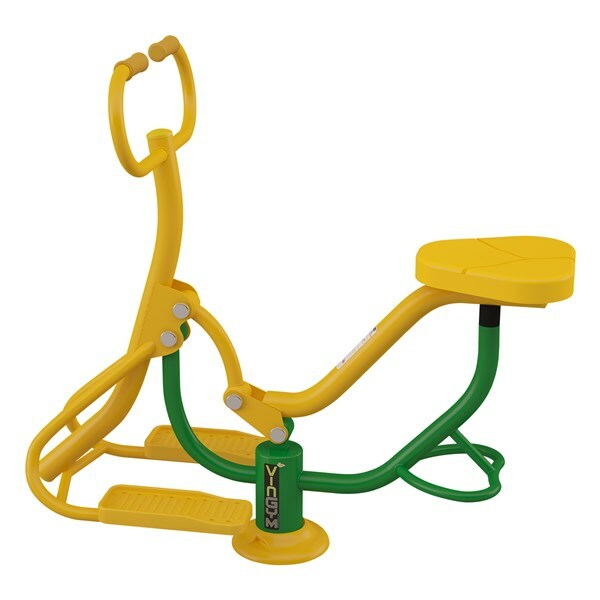 The equipment is powder coated in vibrant colours for a durable finish. It can be easily installed with minimal maintenance requirement. 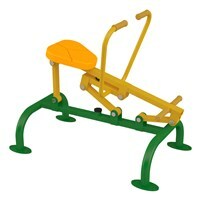 This equipment emphasizes on the Cardio, Lower/Upper Body exercises. VEXGYM-CW ...... ...... Size : 1850 mm x 520 mm x 1850 mm. 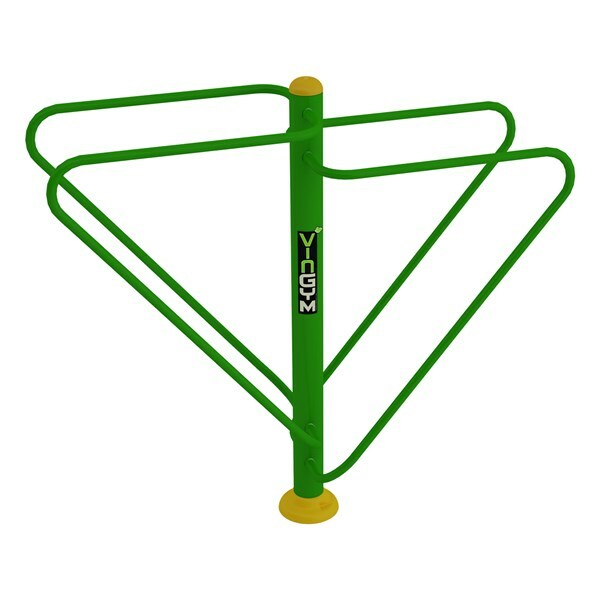 This outdoor fitness equipment is made of heavy gauge steel with strong construction to last in outdoor environments. The equipment is powder coated in vibrant colours for a durable finish. It can be easily installed with minimal maintenance requirement. 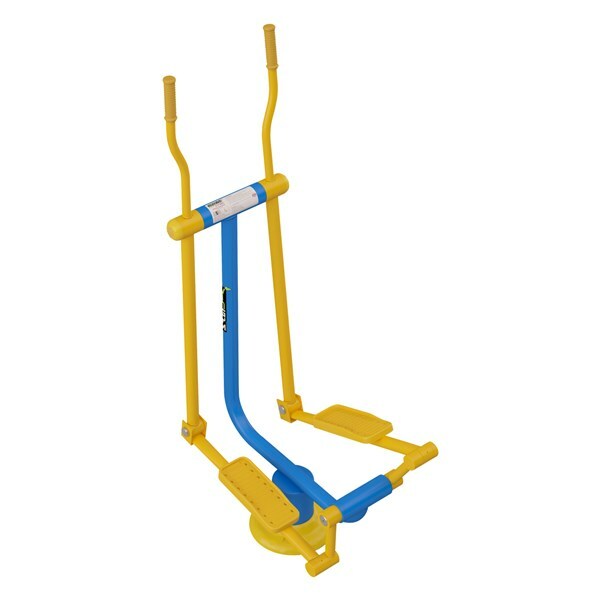 This equipment strengthens lower & upper limb muscles. It improves flexibility of joints and it helps to loose weight. 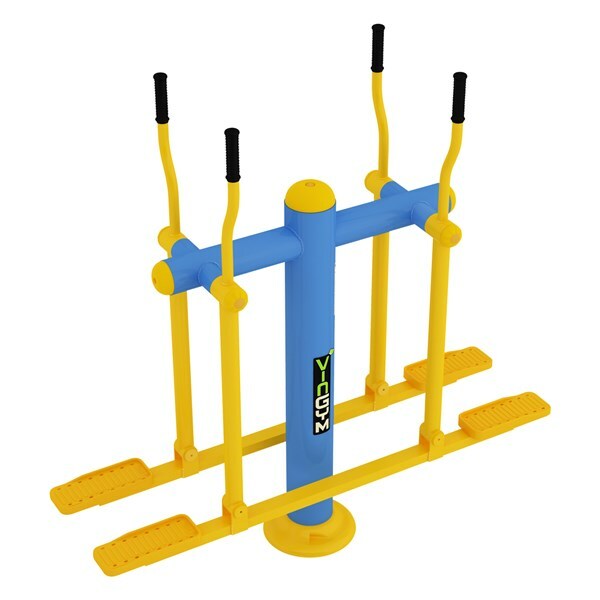 VEXGYM-CYC ...... ...... Size : 1160 mm x 530 mm x 1450 mm. 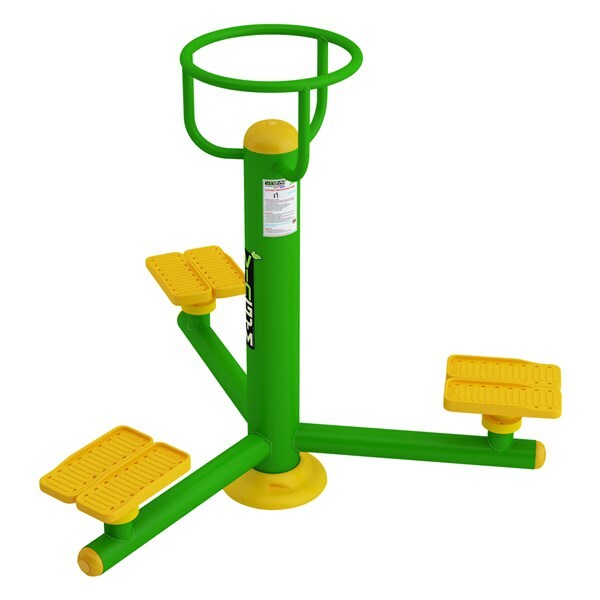 This outdoor fitness equipment is made of heavy gauge steel with strong construction to last in outdoor environments. The equipment is powder coated in vibrant colours for a durable finish. It can be easily installed with minimal maintenance requirement. 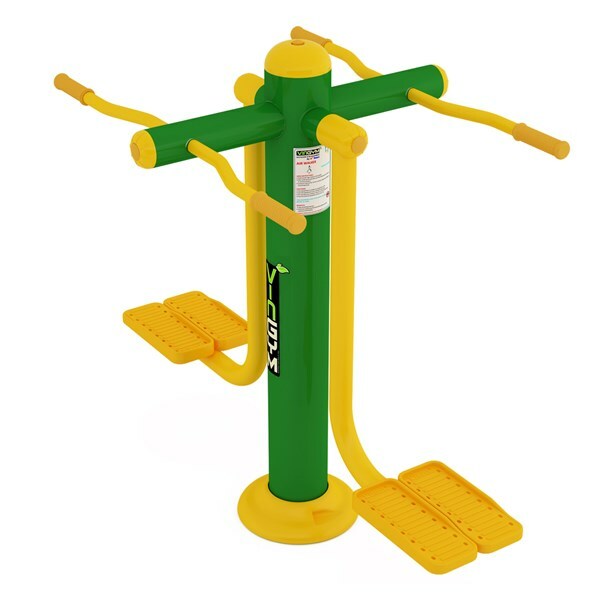 This equipment emphasizes the strength of Arms, Abdominal & Legs and helps to loose weight. VEXGYM-HRS ...... ...... Size : 11800 mm x 590 mm x 1105 mm. This outdoor fitness equipment is made of heavy gauge steel with strong construction to last in outdoor environments. 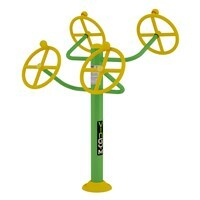 The equipment is powder coated in vibrant colours for a durable finish. It can be easily installed with minimal maintenance requirement. This equipment enhances the strength of Back and provides Abs. 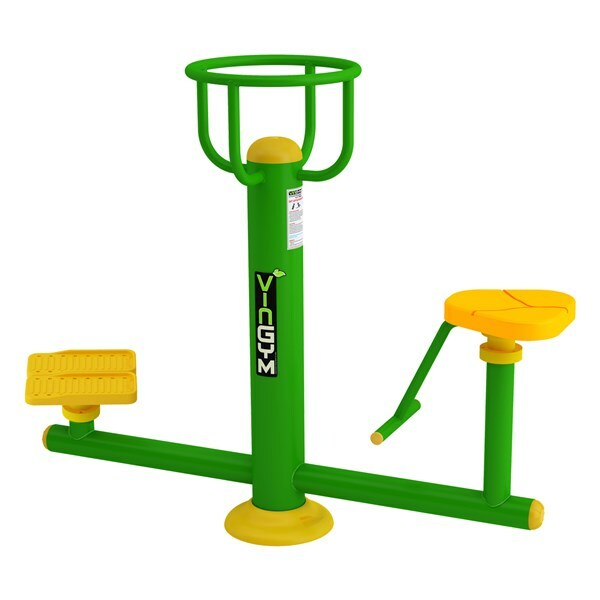 VEXGYM-VABD ...... ...... Size : 1570 mm x 1400 mm x 670 mm. 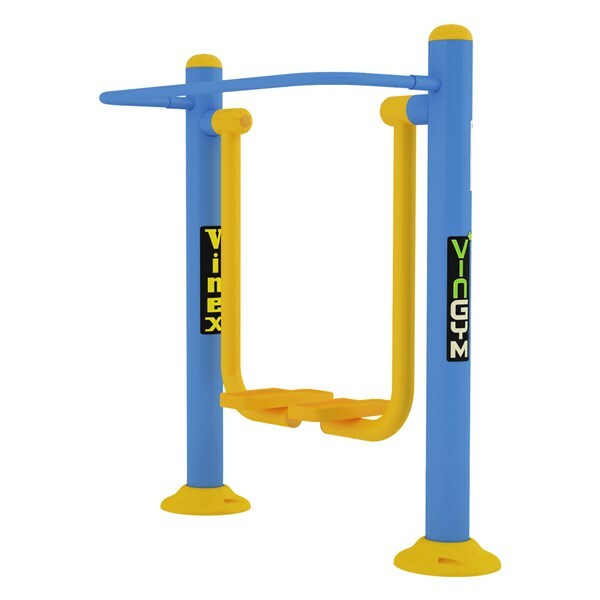 VEXGYM-WLS ...... ...... Size : 1625 mm x 460 mm x 2515 mm. 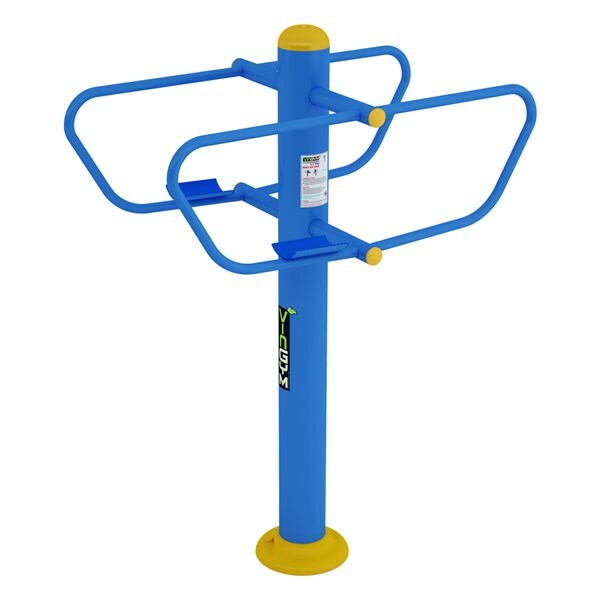 This outdoor fitness equipment is made of heavy gauge steel with strong construction to last in outdoor environments. 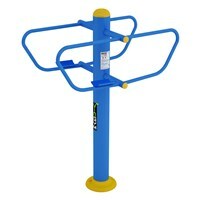 The equipment is powder coated in vibrant colours for a durable finish. It can be easily installed with minimal maintenance requirement. 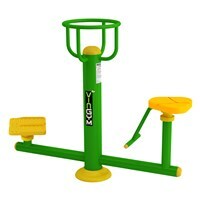 This equipment emphasizes on the Leg & lower Body Muscles. This outdoor fitness equipment is made of heavy gauge steel with strong construction to last in outdoor environments. The equipment is powder coated in vibrant colours for a durable finish. It can be easily installed with minimal maintenance requirement. 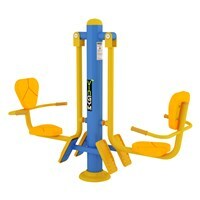 The Chest Press & Lat Pull provides two side-by-side exercise stations. The Chest Press side supports and promotes upper body strength and strengthens the Triceps, Pectoralis, and Deltoids in the pressing motion. The Lat Pull side develops Upper Body strength while simultaneously strengthening the Biceps and Rear Deltoids in the pulling motion. VEXGYM-PPC ...... ...... Size : 2550 mm x 730 mm x 2070 mm. This outdoor fitness equipment is made of heavy gauge steel with strong construction to last in outdoor environments. 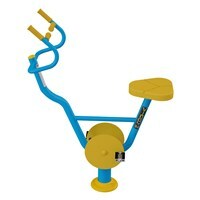 The equipment is powder coated in vibrant colours for a durable finish. It can be easily installed with minimal maintenance requirement. 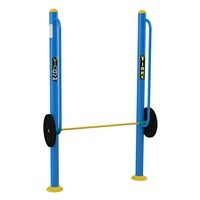 This equipment strengthens the upper body and core body and core muscles. Assists in strengthening the thigh muscles. VEXGYM-CTR ...... ...... Size : 1265 mm x 550 mm x 1780 mm. 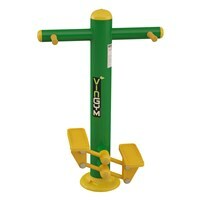 This outdoor fitness equipment is made of heavy gauge steel with strong construction to last in outdoor environments. 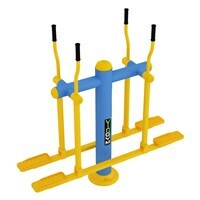 The equipment is powder coated in vibrant colours for a durable finish. It can be easily installed with minimal maintenance requirement. This equipment emphasizes on the shoulder, Elbow and Wrist Muscles exercises. VEXGYM-ARSW ...... ...... Size : 1370 mm x 1160 mm x 1610 mm. VEXGYM-BRL ...... ...... Size : 2610 mm x 1160 mm x 1930 mm. 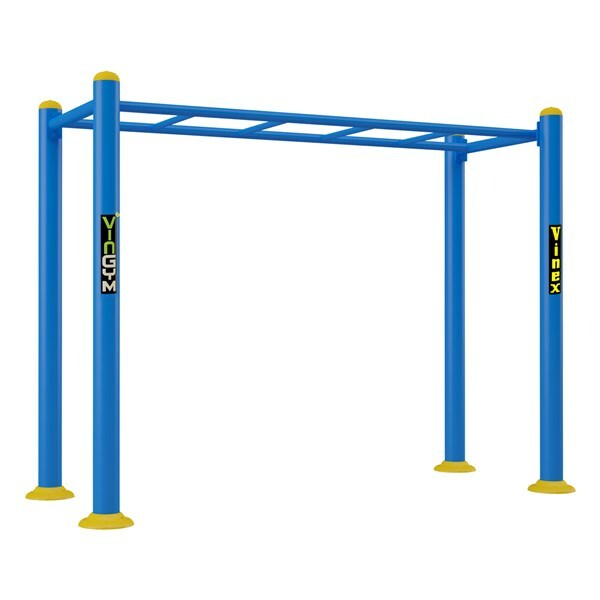 This outdoor fitness equipment is made of heavy gauge steel with strong construction to last in outdoor environments. 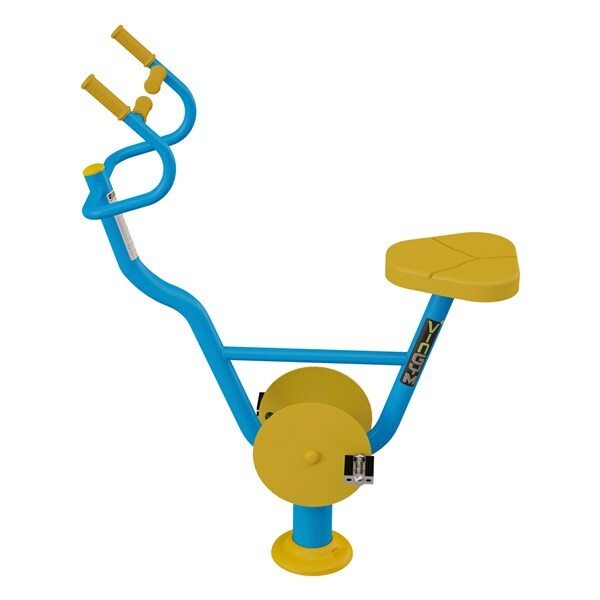 The equipment is powder coated in vibrant colours for a durable finish. It can be easily installed with minimal maintenance requirement. 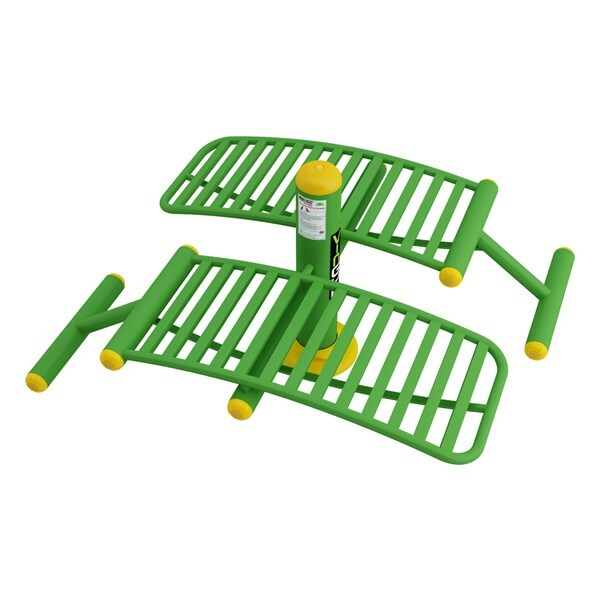 This equipment helps in Back and Spinal Joint exercises. Strengthens Abdominal Muscles and aligns Lower Back and Spine. Assists in increasing flexibility of Upper and Lower Back. VEXGYM-TWLT ...... ...... Size : 1700 mm x 510 mm x 1425 mm. VEXGYM-SUPB ...... ...... Size : 1660 mm x 770 mm x 1440 mm.